The purpose of this Public Notice is to identify consulting parties who would be interested in assisting with the development of a Programmatic Agreement (PA) that would govern the implementation of the United States Army Corps of Engineers’ (Corps) responsibilities under Section 106 of the National Historic Preservation Act (NHPA) for undertakings that may affect the Blair Mountain Battlefield, a historic property. The scope of the proposed PA would be limited to requests for Department of the Army (DA) authorizations submitted by the three applicants listed below for projects that would be subject to the Corps’ regulatory authorities under Section 10 of the Rivers and Harbors Act (RHA) of 1899 and Section 404 of the Clean Water Act (CWA). The applicants are: WPP LLC, Aracoma Coal Co. (Alpha Natural Resources) and Mingo Logan Coal Company (Arch Coal). 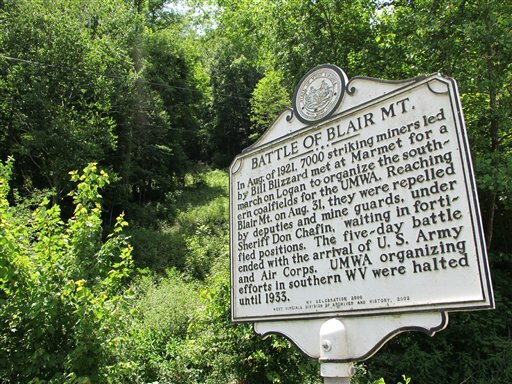 c) the activity may affect the Blair Mountain Battlefield. This PA would describe the procedures that would be followed to implement Section 106 of the NHPA for any Corps undertaking that meets all three of the criteria listed above. The purpose of the PA would be to establish a program for consultation, review and compliance with Section 106 of the NHPA when agreed upon criteria are met and procedures are followed.